Lucius Cornelius Sulla (138-78 B.C.) - Let's pick up where we left off with Gaius Marius; for that's were Sulla's life and career first came to Rome's attention. He had been the one responsible for capturing Jugurtha and, while Marius took credit as the commander of the war, Sulla's role did not go unnoticed. It was hard not to notice the statue of Sulla, riding on a horse, erected in the Roman Forum in his honor. In addition to the rivalry between them over personal glory, they were also on opposite sides of a socio-political struggle that had been growing in Rome since the time of the Gracchi Brothers (that is roughly 135 B.C.). It was the struggle between the Optimates and Populares. As Roman wealth and power grew, so did tensions between the upper and lower classes. The lower class, known as plebeians, were largely omitted from the political process, although they did have Plebian Council, which offered them some say. The upper class, known as patricians, held most of the political power in Roman society. However, starting in the second half of the 2nd century B.C., more and more politicians began fighting for the rights of the plebeians. While certainly a noble goal, and fought for genuinely by some (like the Gracchi), eventually more and more public figures began using this movement to draw power from the senate and take it for themselves. They were the Populares (from which we get the word populist). Those who fought to keep power in the senate, and thus indirectly in the hands of the patricians, were the Optimates. Gaius Marius was among the Populares (remember his move to open military service to non-land owners). Sulla was in the camp of the Optimates. As his power continued to grow, he was elected consul for the first time in 88 B.C., and appointed to deal with Mithridates VI of Pontus in the eastern Mediterranean (see Mithridatic Wars). After he departed for the Italian coast, Gaius Marius, who wanted to lead the campaign himself, made one last attempt to seize power. He sent an ally, tribune Publius Sulpicius Rufus, to the senate to make an impassioned plea to have Sulla's command revoked, which it was. News of this highly unusual move reached the streets of Rome and riots broke out. Weighing his options, Sulla decided to march his army on the city, which was unprecedented. He put down the riots, restored order and entered the senate. Marius was declared an enemy of the state and fled Rome for the surrounding countryside (he died the following year). Sulla resumed his campaign against Mithridates which was successful, but once again, opponents turned sentiment against him in his absence. As a result, upon his return, he marched his army on Rome again in 83 B.C.. But this time it was not unopposed. Rome's newly elected consuls, Scipio Asiaticus and Gaius Norbanus, both raised armies to meet Sulla. Norbanus faced him first at Canusium in southest Italy, but was beaten badly. With news of Sulla's return and victory against Norbanus, his popularity soared and public support swung back in his favor. As Sulla marched north, he met Scipio Asiaticus at a town called Teanum Sidicinum. 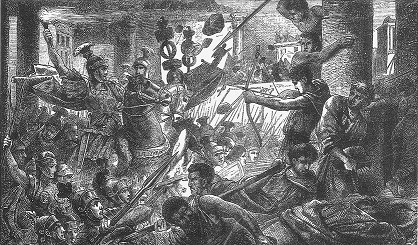 Asiaticus' men had no appetite to face Sulla's battle-hardened soldiers and Asiaticus surrendered without a fight. The Senate, not knowing where Sulla's loyalty lie, raised more armies, but he beat them all, in part because many of their soldiers defected and joined him. Finally, Sulla triumphantly entered Rome and the Senate resigned itself to his victory and proclaimed him dictator, something that had not been done since the Second Punic War. There was no limit to his power, nor his term. He was Julius Caesar before Caesar. Initially, Sulla was everything you'd expect of a dictator. He executed everyone he perceived to be an enemy of the state. Julius Caesar was a young man at the time, and his influential family was targeted (remember Caesar's aunt was married to his arch-rival, Marius). Fearing for his life, young Caesar fled the city. Plutarch and Suetonius both note Sulla's regret in letting Caesar escape his purge, fearing that "in Caesar, there are many Mariuses." Sulla then instituted a number of reforms intended to strengthen the Senate. Then, to most everyone's surprise, he resigned as dictator in 81 B.C., and returned power to the Senate. Remember he was an Optimate, and used his power to restore Rome's traditional form of government; though few knew that was his intention all along. And his attempts to salvage the Republic ultimately failed, as those with even greater ambitions than his would soon enter the stage.